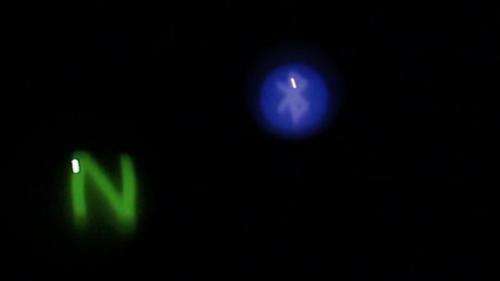 Multi-sensory technology that creates soap bubbles, which can have images projected onto them or when the bubbles are burst release a scent, will be unveiled at an international conference later this month. The research paper, to be presented at one of the world's most important conferences on human-computer interfaces - ACM CHI 2014 [26 April-1 May], could be used in areas such as gaming or education and encourage a new way of thinking about multi-sensory technologies. 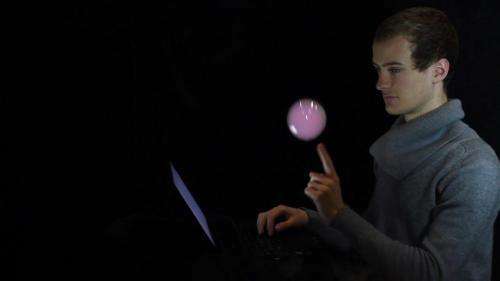 SensaBubble, led by Professor Sriram Subramanian from the University of Bristol's Department of Computer Science, is a chrono-sensory mid-air display system that generates scented bubbles to deliver information to people using different senses. The bubble-based technology creates bubbles with a specified size and frequency, fills them with an opaque fog that is optionally scented, controls their route, tracks their location and projects an image onto them. Sriram Subramanian, Professor of Human-Computer Interaction in the University's Bristol Interaction and Graphics group, said: "The human sense of smell is powerful, but there are few research systems that explore and examine ways to use it. We have taken the first steps to explore how smell can be used to enhance and last longer in a visual object such as a soap bubble. 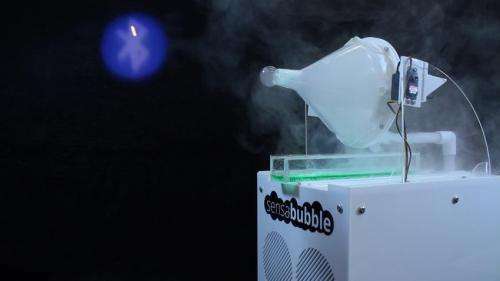 "There are many areas in which bubble-based technology like SensaBubble could be applied, such as a SensaBubble clock that releases the number of scented bubbles corresponding to the hour or SensaBubble Maths, an educational game for children, which incorporates smell as feedback on their success." Interactive technologies that are directly targeted at generating public interest and drawing the user's attention have many applications in advertising and certain forms of education, such as museum exhibits. SensaBubble could be adapted for use in a variety of areas including education, alerts and engaging user experiences. More information: Paper: SensaBubble: a chrono-sensory mid-air display of sight and smell, Sue Ann Seah, Diego Martinez Plasencia, Peter Bennett, Abhijit Karnik, Vlad Otrocol, Jarrod Knibbe, Andy Cockburn, and Sriram Subramanian, Proceedings of ACM CHI 2014 Conference on Human Factors in Computing Systems. Toronto, Canada. 2014., 26 April-1 May 2014. They could use a Dyson Air Multiplier Fan which is bladeless to send the bubbles over long distances. Put the bubble blower in the throat area of the fan. Also, the bubble solution should be warmer than the air so that bouyancy will lift the bubble up higher and longer into the air. Finally, I can imagine rave parties using this technology to send all kinds of smoke wafting around. Every Macys, etc. will be falling over themselves for this technology. Fragrance counters? Camping gear? Technology integration? I would bet this could be big, if they can make it marketable.